The words we choose to express ourselves matter. Language evokes images and carries messages that leave an imprint on society. There are words most of us would never dream of using because they offend or demean others. Why doesn’t this sensitivity extend to babies? I suppose it’s okay to diss babies because they can’t complain, picket or sue. They have no power. They’re not a major consumer group. Why don’t we think to question this term? We know that children are not socks or handbags (or even fur), they are human beings. And yet we use an expression that perpetuates the objectification of babies. Carrying babies is one thing. Wearing them is quite another. It’s time to find another word, and to wear the sling, not the baby. Infant expert Magda Gerber inspired us to treat infants as unique human beings (human being the operative word). She believed that infants deserve our respect from day one. She taught us to communicate with an infant as we would another person, and to take this small person’s point of view into account. Dr. William Sears coined the term “babywearing.” I was absolutely shocked when I read Sears proudly explain on his website that babywearing “humanizes” infants. As if babies need humanizing? What does he believe an infant is, if not human? And he’s a doctor! Suddenly his invention of the word ‘babywearing’ makes perfect sense. Sorry, but I have both scientific and anecdotal evidence that babies are born human. References available upon request. Carrying a baby as a passenger while we go about our day is not “intimately involving” the baby, in my opinion. To intimately involve a baby is to give her our full attention. It is to hold her, not only with our bodies, but with our minds and our hearts. 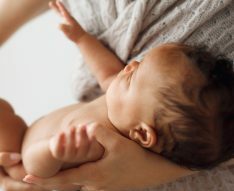 It is to hold her close often, but to also give her freedom to move, and respect her individuality, her “otherness.” It is to create a peaceful life geared towards a baby, and to then be responsive to her communication. Not the other way around. Dr Sears, for the last time, we do not “teach” infants to be human. Please, take a moment to truly behold an infant — to really look, listen, and be totally present. You will realize that an infant teaches you how to be human. In defense of Dr. Sears (and Im not even particularly a fan of his) I think you’ve grossly misinterpreted his message. I agree with previous commenters that wearing your baby as opposed to other means of transportation does humanize the baby TO THE PARENT. I very often see parents ignoring the cues of babies hidden in strollers, pushed around like nothing more than a shopping cart. When a parent wears a baby its much harder to miss cues and much easier to respect the baby’s human needs in accordance with RIE principles. But that isn’t what Dr. Sears meant by “humanize”. He said “teaches them to be human”…and was clearly referring to teaching the baby. He didn’t mean humanizing the baby in the parents’ eyes. In a baby carrier, they are able to see the goings on of their world. And isn’t this how parents have been caring for babies for centuries? Until very recently in the modern world? What an interesting post and lots of passionate comments! I know this was awhile ago. I’ve never really identified with the term “babywearing” even though as a city Mom often on the subway, my son has spent and enjoyed his fair share of time in his. At two years old, I now ask if he wants “to ride with me.” He still loves to ride with Mommy! All i can say is actions speak louder than words and people are full of words. Why does everything need to be analysed and nick-picked to the n’th degree. Love your kids and parent the best way you can. We should be supporting each other not arguing the tiny points. Exactly. No point in being pedantic – they’re loving on and caring for their kids. It’s saddening to see her participate in this kind of parent shaming. I have never read Dr Sears, but came across baby wearing completely independently. I am astonished that this article dimisses anyone who carries their baby close and implies that it is a negative process. I know many parents who could give anecdotal evidence about how Baby Wearing reduced post natal depression, encouraged parental bonding not to mention helping with breast milk production and reduction in reflux. Please reconsider the title of this article, as it’s more about Dr Sears than what baby wearing really is. Sorry, Lani, but you’ve misinterpreted this post. My (strong) disagreement is with the term that Dr. Sears’ coined: “babywearing”. Thats not how it reads Janet. The title has got such a negative tone, it doesn’t encourage anyone who carries their child close to read your post. If I hadn’t been following you for some time, I would have immediately “switched off” at this post. We are trying to do our best to NOT be judgmental to other parents but this casts aspersions against a huge group of parents, who by accident or purpose, are journeying towards RIE. I’m in Australia, and for me, Sears is a shop they mention on tv made in the USA so wether he is using terms you disagree with means little over here. Your international audience might appreciate a different title so that its about dr sears, not babywearing. Thanks for taking the time to reply. Usually I agree with your posts, Janet Lansbury, but this one left me with a bad taste in my mouth. You see, I am a dad with mitochondrial neurogastrointestinal encephalopathy (say that 10x fast) and i don’t have much strength in my arms anymore. When my son was a baby, I could not hold him reliably. So what my wife did was wrap my son with one of those woven wraps she so loves, and I could wheel him around in my wheelchair. I was a human stroller–how’s that for objectifying? 🙂 It was a happy time, some of the best memories in an otherwise dark past few years. Riding on my chest, we would roll around the apartment in my powerchair when he was fussy, or when he just wanted to spend some time with me. There is no way i could hold him for more than 5 minutes or so. I’m a high school English teacher and you don’t have to tell me that words matter. If you don’t like the term Dr. Sears coined or see it as “objectifying” of babies, why not develop other ways of speaking about the use of wraps, slings, buckle carriers, and so on? As a disabled dad, I can call it “using an adaptive parenting aid” and you can call it whatever you want. You might see it as a “container” that constrains the baby’s natural motor development. I see it as an essential tool that allowed me to cuddle up to and bond with my son in ways that would otherwise not be possible. It also allowed me to help my wife by holding him while she took a shower or practiced self care. Call it what you want but I thank God for the “babywearing” community and their swap groups, online stores, and meetups. My wife got a lot of helpful tips from Babywearing International, an organization that helped us figure out how to use all the woven wraps and carriers we had. Let’s be honest here–many times when products are marketed as adaptive products for disabled folks, they rarely ever become mainstream. you’re not going to find adaptive parenting products at Babies R Us because it’s not profitable. The fact that a disabled person can go to a mainstream store and find baby carriers that will help them physically carry their own child is quite amazing. I also appreciate the fact that using the baby wraps and our Ergo helped my wife meet my son’s desire to be held while also having her hands free to do other things, like change my colostomy bag or start dinner. Sometimes both at the same time–colostomy issues usually happen when she is trying to have dinner. I have a memory of watching her breastfeed our son in the baby wrap WHILE taking a work call on speakerphone WHILE changing my IV port. If it wasn’t for that wrap, our son would probably be in his “Yes Space” shrieking his little head off. If you’ve ever tried having a business conversation or changing someone’s IV access, it’s not easy to do with screaming in the background. I do remember lying there in awe of the superwoman I married and all of the various hats she now wears. Perhaps that’s not the sort of emotional connection Magda Gerber thinks mothers should have with their babies all hours of the day, but not all of us can hire professional “Educarers” while we go about our many daily duties–especially when you have the expenses we have. I find it insulting that you would dismiss “babywearers” as if we do not believe that babies are fully human. I don’t think your remarks about Sears or those who practice babywearing are particularly charitable and they come from a place of able bodied privilege. You might be in a place where you can CHOOSE to “go naked” rather than “wear baby” but for some of us, our choice is to use adaptive products or simply go without physical closeness with our own children. Ches – I am sincerely sorry my opinions offended you and that you felt dismissed. I suggested some terms here in earlier comments as an alternative to babywearing: babyholding, babybundling, babysnuggling, babynuzzling, babyjoining, babykeeping, babyembracing, babycradling, babynestling. I do not believe that one would coin a term like “babywearing” (and talk about how this “humanizes” babies) from the standpoint of viewing an infant as an actual person. But that isn’t to say that everyone who chooses to follow Sears’ approach perceives as he does. It sounds like utilizing the wrap was a godsend for you and your wife and I can certainly appreciate that. You may be interested to learn that in some languages (French for example, possibly other Latin languages) the verb “to wear” is the same as “to carry” (porter), so saying I carry my baby is exacly the same as I wear my baby. Some of y’all misunderstood the intent of the post. Janet isn’t against babywearing; she is – from what I gather – against the term we’re using to describe the action/concept.